SEC Network Features Wall-to-Wall Studio Coverage from Atlanta - ESPN Press Room U.S.
SEC Network’s coverage of 2018 SEC Kickoff Presented by Regions Bank boasts 45 hours of live programming from Atlanta, including a special edition of SEC Nation live from Centennial Park on Sunday, July 15 at 6 p.m. ET. SEC Nation will feature host Laura Rutledge, analysts Paul Finebaum and Marcus Spears, along with reporter Lauren Sisler. ESPN’s new Monday Night Football announcing team of Joe Tessitore, Jason Witten and Booger McFarland will play significant roles in the special SEC Summerfest show, joining the Nation crew to preview the 2018 season while on their nationwide trek to the 32 NFL franchises. The trio is well-versed in the headlines and heartbeat of the SEC, as Tessitore previously hosted SEC Nation, and Witten (Tennessee) and McFarland (LSU) are former SEC football standouts. Other college football analysts expected to be on hand include Gene Chizik, Greg McElroy, David Pollack and Jordan Rodgers, as well as Georgia head football coach Kirby Smart and Auburn’s Gus Malzahn. SEC Nation analyst Tim Tebow will join the crew remotely from the Binghamton Rumble Ponies’ away series in Akron, Ohio. 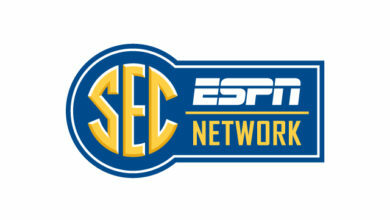 SEC This Morning, hosted by SEC Network anchor Peter Burns and former LSU All-American and co-host of Thinking Out Loud Marcus Spears, airs live weekday mornings on Sirius XM. The duo delve into all things SEC, with all the headlines, highlights and hijinks from around the conference. For the first time, the show will be simulcast on SEC Network live from the SEC Network set at the College Football Hall of Fame and will air from 7 a.m. until the start of each day’s podium action at SEC Kickoff Presented by Regions Bank. SEC Now: 2018 SEC Kickoff Presented by Regions Bank will have full coverage from Atlanta beginning Monday, July 16 at 10 a.m., with analysis and insight of the day’s proceedings. Coaches from all 14 SEC teams will stop by during their time at the media event, as the show films live from the SEC Network set at the College Football Hall of Fame. SEC Network studio host Dari Nowkhah, along with Burns, will anchor the 22 hours of coverage around all 14 coaches’ podium trips. The network’s coverage will also be anchored by The Paul Finebaum Show each day, with eight head coaches slated to appear, including Alabama’s Nick Saban, LSU’s Ed Orgeron, and Will Muschamp of South Carolina. The show, which will have reaction to the latest news and buzz of the annual college football kickoff event, will also air on ESPN Radio. Featuring one of the greatest comeback stories in swimming history, the latest chapter in ESPN Films’ SEC Storied series is “Rowdy.” Premiering Monday, July 16 at 7 p.m. ET on SEC Network, the film chronicles Rowdy Gaines’ career in and out of the pool, including overcoming the adversity of the 1980 Olympic boycott and his battle with Guillain-Barre Syndrome. Directed by Hannah Storm and produced by her company, Brainstormin’ Productions, “Rowdy” is presented by Chick-fil-A. For more information, please click here. Homecoming, the special hosted by SEC Network on-air personality Paul Finebaum, airs periodically throughout the year and features notable SEC alumni returning to their schools. In Tuesday’s episode, airing July 17 at 7 p.m. ET, Finebaum goes in-depth with Billy Payne, former chairman of Augusta National Golf Club and president and CEO of the Atlanta Organizing Committee for the 1996 Olympic Games. A two-time graduate of the University of Georgia, earning both his bachelor’s degree and his J.D. in Athens, Payne shares his recollections of life in Athens, where he was born while his father was a football player for the Bulldogs. Payne and Finebaum also discuss Payne’s career playing at Georgia, as well as his memories of the Atlanta Olympics and Augusta. In addition, ESPN’s College Football Live will have highlights and headlines from each day’s press conferences. For more on ESPN’s presence at 2018 Media Days from around the college football landscape, please click here.